The city of Monterey was not always the bustling hub of tourism it is today, but it always has been an important part of California's Central Coast. Discovered by Spanish explorer Sebastian Vizcaino in 1602 and founded in 1769 by Gaspar de Portolà, the city served as the capital of Alta California from almost the beginning. The name probably derives from the city of Monterrey in Nuevo Léon, México, which itself was named after Our Lady of Monte Rey, the mountain in question being named after Saint Louis IX of France (San Luis Rey de Francia). Francisco priest Junípero Serra established a permanent settlement there the following year within the bounds of the Presidio of Monterey. In 1777, the city became the capital of all of California (Baja and Alta) and remained that way until Alta California was ceded to the United States. On July 7, 1846, the US flag was raised over the custom house and the city's history as a part of the United States began. Unlike many other places in California, Monterey actually lost some of its prominence post-annexation. The city ceased to be the capital of California, replaced in quick succession by San José and Benicia before finally settling permanently at Sacramento. The town remained relatively small and isolated, with its fishing industry providing its primary income. 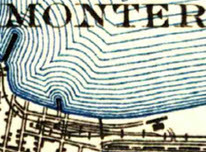 Numerous piers and wharves pierced the adjacent Monterey Bay, supplying shipping and fishing services. It was beside these that the railroad first established itself in Monterey. The narrow-gauged Monterey & Salinas Valley Railroad first entered the scene in 1874, cruising in a fairly direct path from Salinas. 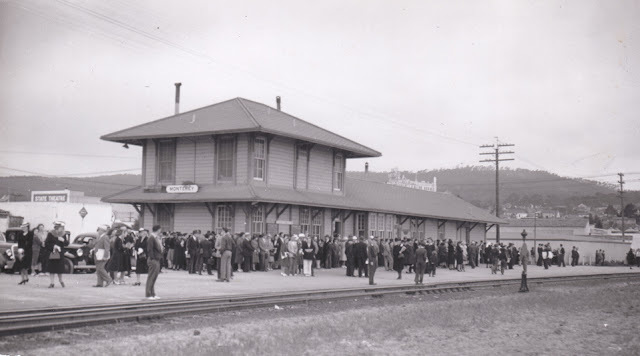 It allowed local farmers, fishermen, whalers, and other merchants to finally get their products quickly to market via the Southern Pacific Railroad mainline in Salinas. Conveniently, the arrangement worked so well that the Southern Pacific purchased a bankrupted Monterey & Salinas Valley Railroad in 1880, soon realigning the branch line from Salinas to a junction at Castroville. 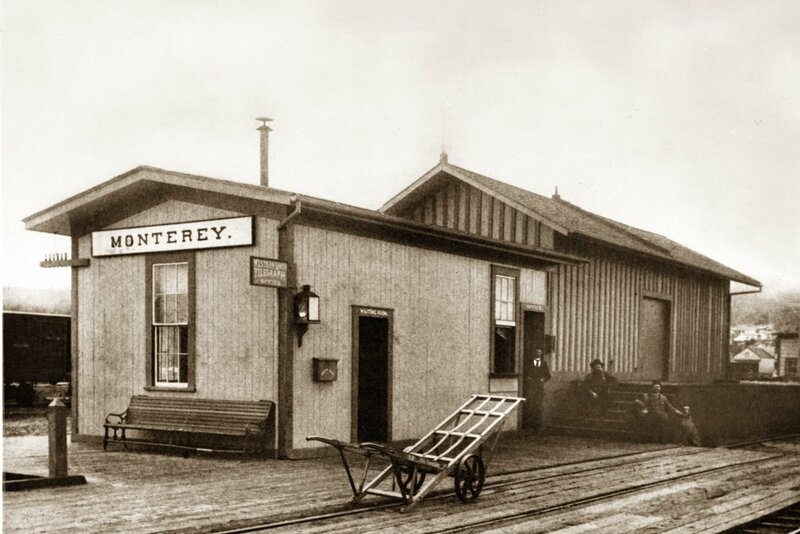 The original Monterey Station depot building with adjacent freight warehouse, c. 1890. The railroad tracks ran directly alongside the shore just in front of the entrance to what is today Fisherman's Wharf and Municipal Wharf #2. While no tracks ran down the short wharf, a relatively large freight yard was built that stretched along five block-lengths of city streets. A siding ran the length of this area while additional short sidings and spurs supported the station. Wharf #2 at that time was the Pacific Steamship Company pier, much like Gharky's Wharf in Santa Cruz, and it catered to steamships that travelled up and down the coast. The heart of the fishing industry was slightly to the east of the station in a district that today is known as Cannery Row. 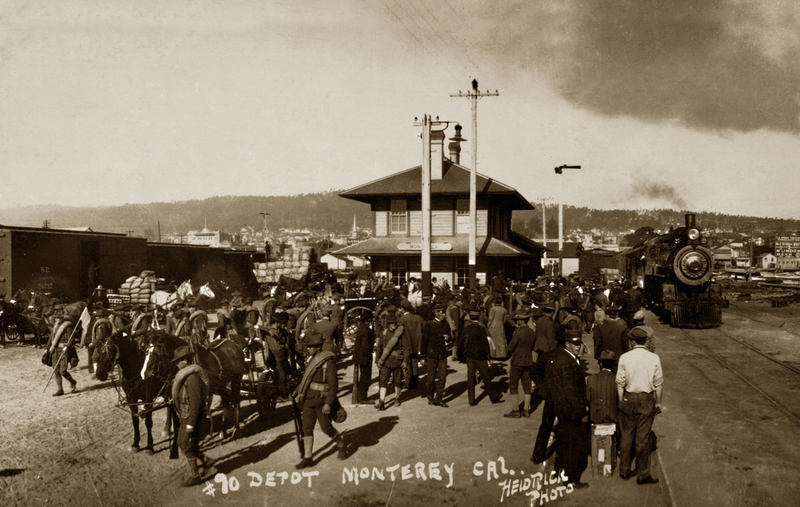 It was there that cargos were provisionally loaded onto waiting box cars to be organized at the Monterey depot (in later years, they would be packed and loaded for shipment on-site behind the canneries). The Union Ice Company kept an ice house between the pier and the station for use by refrigerator cars. For many years, the Southern Pacific kept the original simple depot structure of the M&SVRR. It was composed of a single rectangular shack with a few windows and a few doors cushioned between the mainline track and its siding. On the platform behind the station, the freight depot stood, a windowless wood-paneled barn. Neither were impressive so it was not surprising that the Southern Pacific sought to replace them with one of their cookie-cutter standard-guage structures. The new building included telegraph services, a passenger and freight office, and an on-site agent available any time. The structure grew, too. By 1940, it had expanded into quite an impressive facility. One third of the building was a two-story agent station, ticket office, telephone and telegraph office, and living quarters. The remaining two-thirds were used for freight storage and supplies. In the 1910s, the fishing industry exploded in growth and dozens of canneries opened along the railroad right-of-way between Monterey Station and Pacific Grove. Monterey Station became a major stop along the line, but freight stops sprang up along the branch to cater to the individual canneries, with the largest freight yard established in Pacific Grove, where the trains could be turned around. 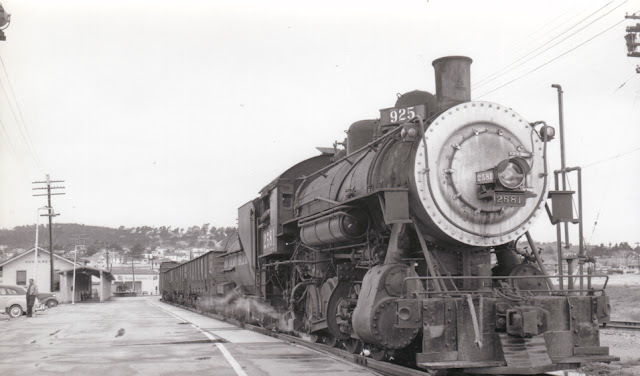 Thus, Monterey was never the largest freight yard on the line nor did it have the largest yard space. Its spurs and sidings fluctuated from as little as 650-feet of spur space (in addition to its siding) in 1907 to over 6,000 feet in 1937. World War II destroyed the tourism industry in Monterey, with the Hotel Del Monte purchased by the US Navy, and the fishing business ended suddenly at the same time when the sardine schools disappeared from overfishing. In response, the railroad depot was partially demolished with the two-story section removed entirely leaving only the much smaller, single-story portion remaining. A patio was added along the track side of the building to shelter waiting passengers. This small station no longer included an on-site resident and seems to have been mostly used for storage, although a small agency office was maintained at least some of the time. Passenger service along the Monterey Branch had been dwindling since 1941 but it finally ended in April 1971 when the last Del Monte train passed beside Monterey station. Freight services, continued for another seven years, ending at last in 1978 when the branch was reduced to Seaside. 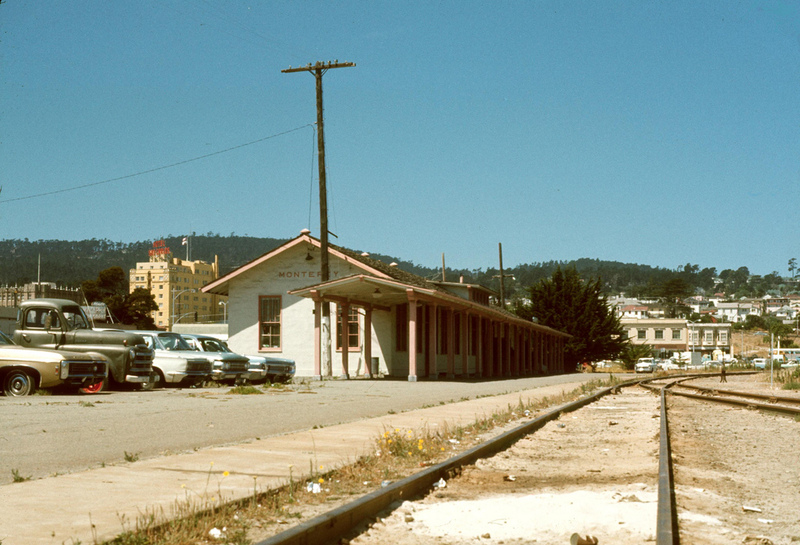 Tracks still pass beside the station today, but they are paved over by the Monterey Bay Coastal Recreational Trail. The depot building remains behind, a railroad station miles away from the nearest track. For many years it was abandoned and decaying, but it has recently been repurposed by The Wharf Marketplace as a permanent farmers' market. The Monterey & Salinas Valley Railroad established the first station at the base of the Pacific Steamship Company pier in 1874. This structure was replaced in the 1880s after the Southern Pacific Railroad purchased the line. By 1899, the station included telegraph service, a freight and passenger office, an A-class freight platform, and a 13-car (650-foot) spur. The spur was reduced throughout the early 1900s but the total yard trackage increased to 5,500 feet by 1930. At this time, the station was located 125.7 miles from San Francisco via Castroville, Gilroy, and San José. The maximum size of the trackage was 6,100 feet reached in 1937 before the size began to shrink. 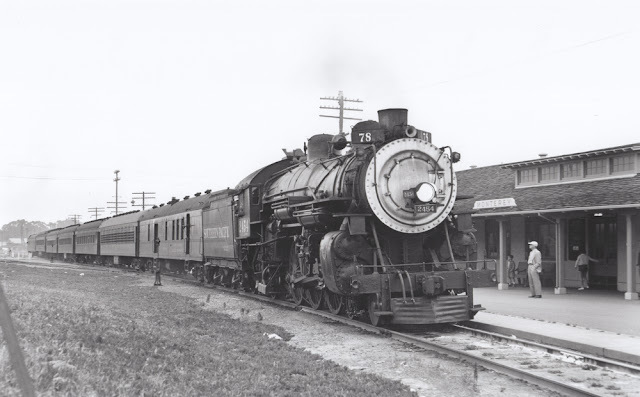 In 1963, the yard size was down to 1,470 feet of trackage and it remained this size until the station closed in 1978. Passenger service had ended in 1971. Monterey Depot still stands today at the base of Monterey Municipal Wharf #2 (with Sapporo Japanese Steakhouse at its base) and beside the Monterey Bay Coastal Recreational Trail. It serves as the home of The Wharf Marketplace and is accessible during normal business hours. a Greyhound bus which took many of us back to San Jose and beyond that evening. Thanks for this. I'm cycling along the trail in Sept. and will look out for it. I always liked the station, but years of actively trying to discourage ridership left the area a crumbly mess. I think the station spent most of the 70s crammed full of warehoused marine supplies. The last train out to Lake Majella was probably August 1977, but the freight train would still use this spot for turning around and idling during lunch and possibly waiting for the close of business along the line before heading back to Watsonville. The Monterey page of the stations section of this great site claims the PCSSCo used Wharf No.2(now the Commercial Wharf, and not built until later) for its business, but Sanborn maps and other reports indicated that firm use Wharf No.1(now "Fishermen's Wharf" Unless someone has an SBE type map contradicting, I'm inclined to go with the No.1 version Such maps would also confirm whether or not S.P. rails ever ran onto any wharf there(I think none).